Whether your young lad is celebrating a First Holy Communion or some other blessed event, this embroidered Communion tie will mark the milestone in style. 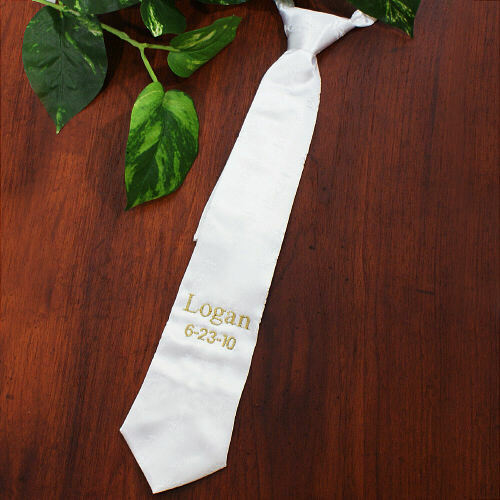 Your personalized youth tie will be beautifully embroidered with a name and date in gold thread to make it a one-of-a-kind tie. This handsome accessory is a pre-knotted, white satin damask tie, which measures 13" in length and features an embroidered Chalice design and adjustable neck clasp. Loved it...I think it's a beautiful keepsake for a very special occasion in my grandsons life..I have one more grandson, so I'll be sure to order another one in a few years..good price too. Grandson's Mother said it was perfect.